El Capitan, the massive granite monolith overlooking the western end of Yosemite Valley, is my favorite attraction in the park. It is beautiful and impressive from sunrise to sunset, under moonlight, in rain and when shrouded in mist. 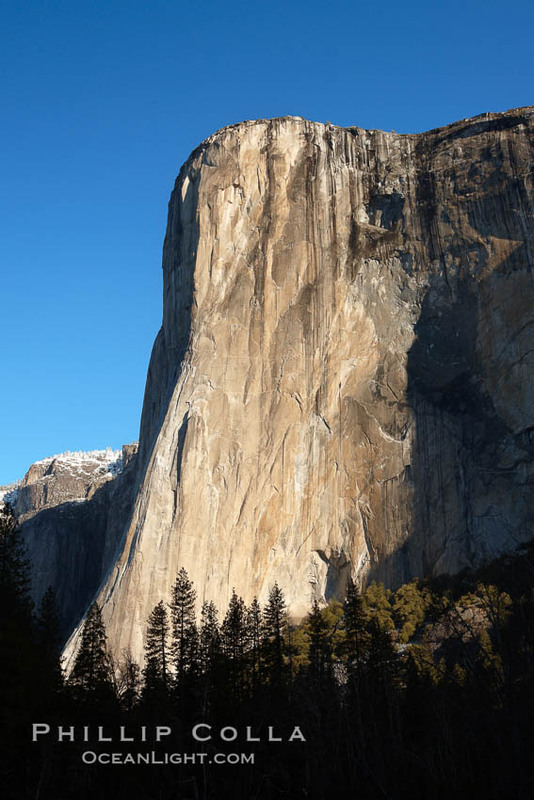 El Capitan, the largest known exposed granite block in the world, stands on the north side of the entrance to Yosemite Valley. Its name is Spanish for “the chief”, and this rock is indeed the most prominent feature of the west end of the Yosemite Valley, rivaled in significance only by Half Dome at the valley’s east end. At 3593 feet (1096 m) high, this massive rock is a popular — though difficult — climbing spot, attracting skilled big rock climbers from around the world. Visitors with binoculars can relax in El Capitan meadow to watch the climbers slowly make their way up the epic cliffs. Each year a few climbers are plucked off the sheer sides of El Capitan by a helicopter rescue team when they get in trouble. Ribbon Falls, on El Capitan’s west side, is Yosemite National Park’s highest unbroken waterfall (1612 ft, 492 m) and indeed one of the tallest in the world. Horsetail Falls, which flows off El Capitan for a few months in winter, produces a natural “firefall” for a few weeks in winter, if the conditions are right. El Capitan eastern face, sunrise. As an alternative to the usual view of El Capitan above, a couple days ago I posted an infrared photo of El Capitan, in which the granite face stood in stark contrast to the tree below it and the cloud-free sky above. If you like this, please see more of my Yosemite National Park stock photos.